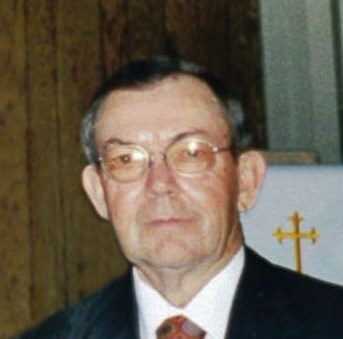 Wayne Robert Coble, 86, of Ramseur, a lifelong resident of Randolph County, passed peacefully into his eternal life on the morning of April 10, 2019, following an extended illness. Funeral Services, 1 PM, Friday, April 12, 2019, at Loflin Funeral Home Chapel, Ramseur. Officiating, Rev. Garry Reeder, Rev. Scott Kidd. Burial, Union Grove Christian Church, Asheboro. Wayne was born on August 26,1932 to the late Coy E. Coble and Cleta Needham Coble. Wayne was a retired vice president of the First National Bank of Randolph County where he enjoyed serving his customers for over thirty years. Upon his retirement, he enjoyed life on his small farm where he cultivated vegetable and flower gardens. Wayne enjoyed collecting vintage farm tractors. He was a member of Union Grove Christian Church, where he served two terms as a deacon and was a loyal member of the Bible Class as long as his health permitted. Survivors: wife of 66 years, Barbara Coble, of the home, daughter, Karen Auman and husband, Ken, of Troy, son, Stephen Coble, of Cookville, TN, sister, Hilda Smith and husband, Tony, of Asheboro, sister-in-law, Sarah Moffitt, of Asheboro, numerous nieces, nephews, cousins and a special canine friend, Lucy. Visitation, 12 PM to 1 PM, Friday, Loflin Funeral Home, Ramseur. Arrangements by Loflin Funeral Home, Ramseur. In lieu of flowers memorials may be made to Hospice of Randolph County, PO Box 9, Asheboro, NC 27204.